Luxury automotive manufacturer Infiniti made a unique appearance this year with dwinQ’s Social Media Engagement Platform at the inaugural Formula One United States Grand Prix in Austin, Texas. Infiniti partnered with dwinQ, a social media engagement company, to allow fans to interact with Infiniti cars and instantly share their experiences with friends on Facebook. A fan experiencing the Infiniti G Force Challenge Simulator Vehicle. There was a single Formula One Champion in Austin, but dwinQ helped Infiniti create thousands of brand champions that shared their experience instantly with friends on Facebook. Luxury automotive manufacturer Infiniti made a unique appearance this year with dwinQ’s Social Media Engagement Platform at the inaugural Formula One United States Grand Prix in Austin, Texas. Infiniti partnered with dwinQ, a social media engagement company, to allow fans to interact with Infiniti cars and instantly share their experiences with friends on Facebook. Infiniti provided Austin Fan Fest guests with opportunities to capture photos while driving in a simulated race game as well as once-in-a-lifetime photos with the Red Bull Racing Formula One car. dwinQ amplified the event through automated social media sharing on Facebook. Cameras connected to dwinQ’s Social Media Engagement Platform were mounted inside the G Force Challenge Simulator Vehicles. The vehicles were real-world Infiniti IPL G Convertibles mounted on dynamometers to simulate an authentic racing experience. While they were competing in the G Force Challenge racing experience, fans could capture photos of themselves in real-time. Another automated photo booth snapped photos of guests in front of a Red Bull Racing Formula One race car. The images from both photo spots were instantly published to Facebook. 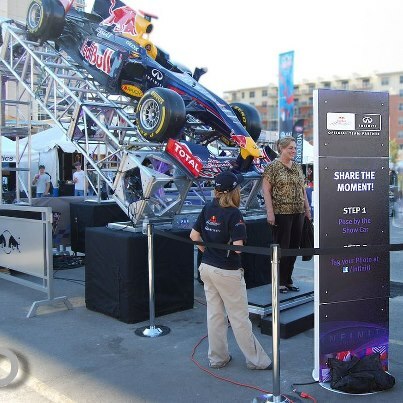 Fans getting pictures taken with Infiniti Formula One race cars instantly upload to Facebook using dwinQ technology. 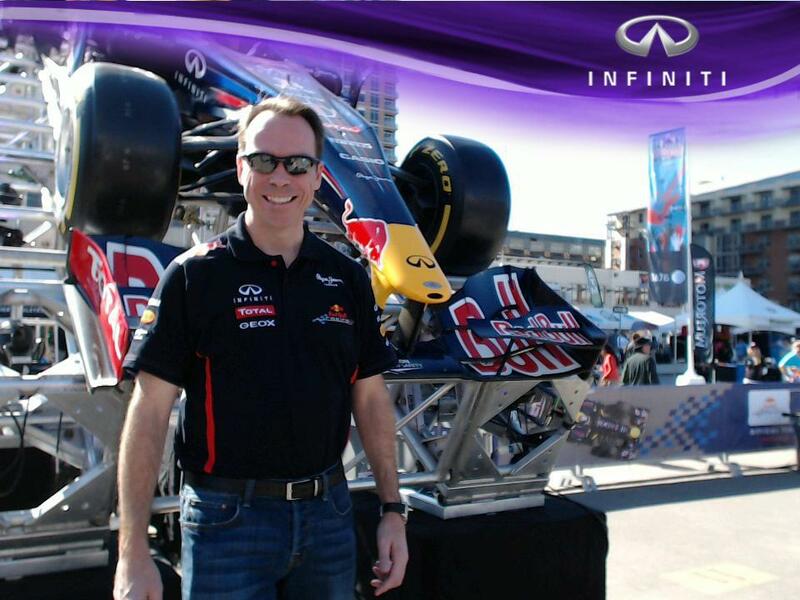 dwinQ Chief Marketing Officer Bret Kinsella standing in front of Infiniti Photospot at Formula One Fan Fest in Austin, TX.